In his first address to a joint session of the American Congress on February 28, 2017, President Donald Trump twice referred to Canada. Canadians generally have not been impressed with Trump and his style. However, given that what happens in the USA matters a lot to Canada, Trump’s remarks had many Canadians chatting. 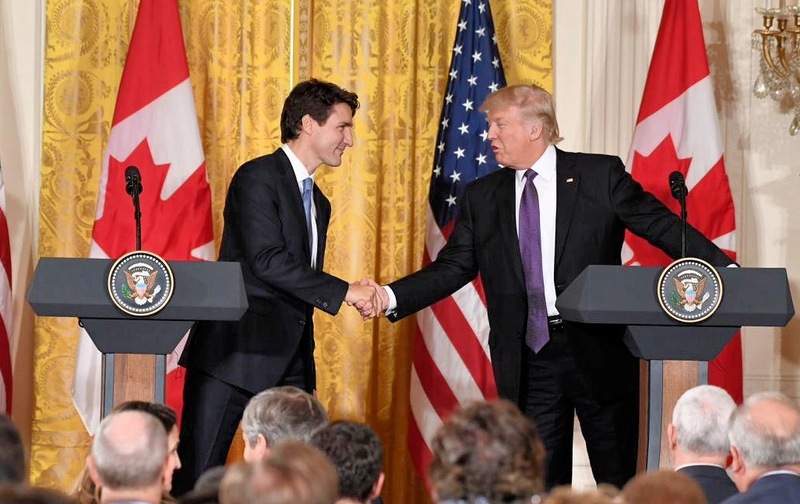 In his speech, Trump mentioned Canada’s Prime Minister Justin Trudeau highlighting the proposed women’s business group, led by his daughter Ivanka, to ensure female entrepreneurs have access to networks, markets and the capital needed to start businesses. He also referred to the Keystone Pipeline that will allow Canadian oil to flow to the U.S., which pleases the oil industry while at the same time is opposed by environmentalists in both countries. In addition, there was extensive analysis of Trump and Trudeau shaking hands and who had the upper hand. One of the biggest surprises in Trump’s address was his call for immigration reform and recommendation to emulate Canada’s model. However, he should also take a serious look at the Canadian healthcare system as a potential solution to U.S. troubles with one of the most expensive and problem-laden healthcare systems in the industrialized world (more on this later). A big difference between Canadian and American immigration policy is Canada favors economic immigrants, while the U.S. provides more green cards to those with relatives in the U.S. Some would compare Canada’s application system for skilled workers to online dating, since foreigners who wish to emigrate to Canada fill out online profiles with information such as language skills, education, age, and much more. The immigration department then categorizes the profiles according to possibilities for success – almost a matchmaking algorithm. The new system in place since early 2015 is the most profound reform in decades. Could it work in the U.S.? Canada’s immigration policy dates back to the late 1960s and is based on a merit-based point system which puts a premium on those with needed job skills. The U.S. system, on the other hand, emphasizes connections to family already in the country. Both countries share a history of once excluding non-white immigrants which began to change in the early 1960s. In Canada, 63% of immigrants are admitted due to job skills. In the U.S. only 13% are admitted as skilled workers. In the U.S., 63% are admitted due to family ties. In Canada, only 24% are admitted due to family ties. 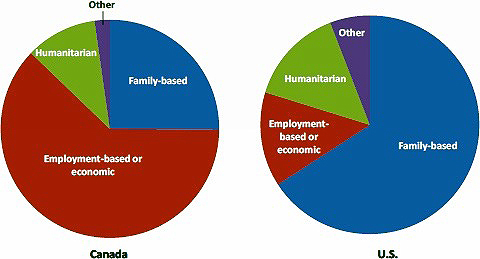 Humanitarian immigrants account for 21% of those admitted to the U.S. while 13% enter Canada for the same reason. For 2016, the United States set an estimated limit of 226,000 for extended family-based green cards and 140,300 for economic green cards. With a population of 35 million (roughly 10% the size of the U.S.), Canada targets 300,000 immigrants per year (almost 1% of the population). Currently, there is talk of increasing immigration levels to 450,000 to 500,000 annually. In contrast, the U.S. targets an annual immigration intake of 0.3 % of its population of 325 million or 975,000. The U.S. and Canada have gone their separate routes with regards to immigration. Canada has endorsed an immigrant-friendly reputation and views immigration as a boon to the economy and a means to solve future demographic challenges due to a low birthrate among the more established European ethnicities. In the U.S., immigration has become a more polarizing issue with many perceiving foreigners as a threat to the American workforce. According to James Witte of George Mason University’s Institute for Immigration Research, the focus on family-based immigration in the U.S. is rooted in the federal government’s laissez-faire perspective on labor market policy. There is a disconnect with the Canadian economic immigrant model because labor policy in the U.S. is handled by state governments. And then there is fierce resistance from labor unions. The Canadian model is new and it is too early to assess the long-term impact. However, one thing is clear – skilled workers can enter the country much more quickly than in the U.S. While Canada may not have the U.S. philosophy of “give me your tired, your poor, your huddled masses yearning to breathe free…” found on a plaque on the Statue of Liberty (an ideal that has inspired many around the world), it has also done its part in welcoming the poor, downtrodden and those seeking liberty. Canada welcomed blacks escaping slavery before, during and after the American Civil War, welcomed the victims of both left- and right-wing dictatorships in Europe, Asia, Latin America, and Africa, as well as refugees from the Middle East. Unfortunately, both countries also have had racist and bigoted immigration policies in the past toward Chinese, Japanese and Jews, for example. The current worldwide refugee crisis is one that should cause reflection. In 2016, the U.S. admitted 85,000 refugees while Canada admitted almost 60,000 (40,000 were refugees from Syria). Remember Canada has one-tenth the population of the U.S. Heightened suspicion of refugees from the Middle East is uncalled for as there have always been some bad apples in each wave of immigration to North America during the past 150 years. Whether it was the Irish wave in the mid- to late 19th century, Jews and Italians in the early to mid-20th century, or those escaping communism from Eastern Europe and Southeast Asia in the mid- to late 20th century, there have always been problems – gangs, mobs, organized crime, drug rings, and more. Potential problems should not be a reason to reject refugees from the Middle East and the Muslim world. There will be problems, but increased border security makes a difference. Employment-based immigration is more important in Canada than in the United States. (Source: U.S. Department of Homeland Security; Citizenship and Immigration Canada; average of new permanent residents over 2009-2013 for both). A recent opinion piece by James Traub provides a view from Sweden as to whether poorly-educated male refugees from conservative Muslim countries can integrate into Scandinavian society compared with secular and prosperous Bosnians or Persians. In Sweden, a strong economy by any standard, it is a taboo topic. The Swedes also reacted strongly to Trump’s comment about alleged refugee violence in Sweden – especially as he got his facts wrong. Again, it is too early to tell what will be the long-term effect of allowing large numbers of refugees from the Middle East. I can relate as both my parents emigrated to Canada from Southern Italy over 60 years ago in their youthful twenties. By today’s standards, they were considered uneducated, spoke neither English nor French and had no “marketable” skills. Most immigrants at the time initially worked as laborers. But as history has shown, many of these supposedly uneducated immigrants to Canada, the USA, Australia, and other countries have done very well (and their descendants), with countless success stories from various ethnic communities. In the long-term, immigration has been positive. According to Canada’s 2016 census, over one million people identified themselves as Muslim, representing 3.2% of the population (double the 2001 figure). Most tend to be highly-educated, with 6% holding graduate degrees. Among females, 57% had post-secondary degrees and 20% had bachelor’s degrees, while 15% of Muslim women had graduate and post-graduate degrees. Canada’s position on welcoming refugees has several aspects. One is its commitment to welcoming the downtrodden. There is also the fact that without immigration, the low birthrate will cause more serious problems. Is the U.S. immune from the demographic problems faced by most industrialized countries in Europe and Asia? It most likely is not. Can it continue without immigration? Adopting some of the positive points of Canadian immigration policy may help the U.S. in the long term. President Trump speaks of draining the swamp, referring to corruption and heavy federal bureaucracy in Washington that needs to be trimmed. Cutting bureaucracy is an issue faced by most advanced countries. However, another swamp needs to be drained – the healthcare mess the U.S. finds itself in. Nobody can solely blame the Obama administration for the sad state of American healthcare since it has been in a sorry condition for more than two generations. It is a systemic problem that most industrialized countries in the world have dealt with more effectively. Trump should look to Canada for a potential solution on healthcare as well, and drain another swamp while it is still possible. This real swamp to be drained results from collusion between the American insurance industry, legal profession, pharmaceutical industry, and their lobbyists. One reason American healthcare is in a sorry state is these industries view healthcare as a market-driven business that must be profitable for their shareholders. American public policy does not seem to consider the nation’s health as a priority – likely the result of a lack of a sense of community. 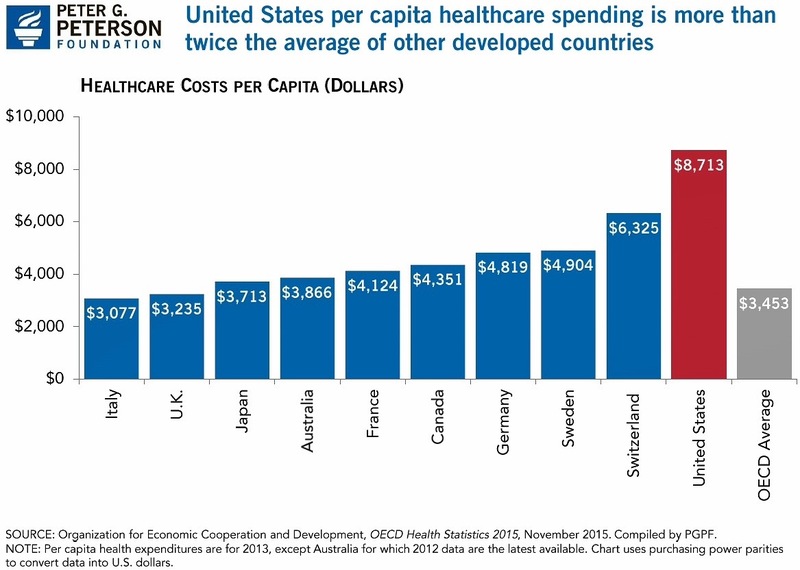 The U.S. spends more than any industrialized country on healthcare. Currently it spends over 17% of GDP on healthcare – by far the highest in the industrialized world. The following countries all spend 11% of GDP or less as of 2013: Germany, Switzerland, Denmark, New Zealand, Canada, Japan, Norway, Australia, with the United Kingdom at 8.8%. Some argue the quality of healthcare is much better in the U.S. That may be so, but the larger issue is most Americans cannot afford it. One reason for the high costs of healthcare is the collusion between the insurance industry and legal profession and the profit motive. In the U.S., doctors must acquire costly malpractice insurance. Also, doctors’ offices must be capable of dealing with numerous insurance providers – most of which compete with each other. A medical practice requires a substantial staff to deal with an immense bureaucracy resulting from the many insurers servicing patients. Furthermore, the legal profession is only too eager to benefit from the tragedies that some may face in malpractice suits. In Canada and many other industrialized countries, malpractice suits are not common because the state has put limits on what an individual may sue for. Most industrialized countries have a single-payer system. In Canada, doctors have private practices and their staffs do not deal with 15 or more insurance companies resulting in complex paperwork. Rather than the multiple insurers involved in accessing their patients’ files, they deal with only one. The Canadian system is managed by the provinces and each province deals with the insurance needs of its citizens. Healthcare in Canada is transferable from province to province. A resident will not be without healthcare if he or she decides to move to another part of the country – a real drawback of the present U.S. healthcare system. The Canadian healthcare system also provides another layer of security: only citizens, permanent residents or individuals on work permits can acquire health insurance. This gives another means to stem illegal immigration. Legal residents are issued a photo ID for healthcare in each province that identifies them as being legally in the country. The newly-introduced Republican healthcare bill includes the establishment of a special fund to help states set up pools to fix their insurance markets or help low-income patients. It is a move in the right direction and should go further by having each of the 50 states manage their own healthcare; i.e., each state should become the only insurer in their own jurisdiction. It would bring the insurer closer to the insured and take healthcare out of the hands of a profit-driven industry concerned less with the health of the community than with the interests of their shareholders. The insurance industry should stay out of healthcare reform. There are many other insurance products to keep the insurance industry profitable. Americans are mistaken to believe the quality of healthcare would be compromised if the U.S. adopted a single-payer system managed by each of the 50 states. There would be tremendous savings for doctors on liability insurance premiums. There would be further savings in premiums for individuals and group insurance plans in larger corporations. The U.S. may need to modify the taxation levels, but it would mean more savings for the American public. Nobody in the industrialized world outside the U.S. pays between $1,000 and $2,000 a month for health insurance — not in taxes or out-of-pocket expenses. It would also help drain the swamp of profiteers who capitalize on the misfortune of the sick and weaker members of society. It would free up funds for research and better quality care. American public policy seems ambivalent about the health of its citizens. There appears a lack of a sense of community. Healthy individuals are the basis for a healthy nation. Herein lies the core philosophical problem. The proof is that healthcare currently is being outsourced to entities motivated by self-interest and not to those with a mind to take care of the nation. There was a time when churches and religious bodies were responsible for healthcare. Many hospitals were founded by religious orders where healthcare was viewed as a vocation. Secularization has led to different experiments in healthcare – universal or single-payer systems and the U.S. model. Neither are perfect. Healthcare is not a Republican vs. Democrat issue since the insurance and pharmaceutical industries continue to give both parties enormous political donations. It concerns the health of one of the greatest nations in the history of humankind. By tackling the American healthcare issue, Trump could create an alliance with both Republicans and Democrats, as well as supporters of Bernie Sanders and others fed up with the continuing collusion of big industry, lobbyists, and corrupt politicians and bureaucrats feeding off the misfortunes of hard-working Americans. Rev. 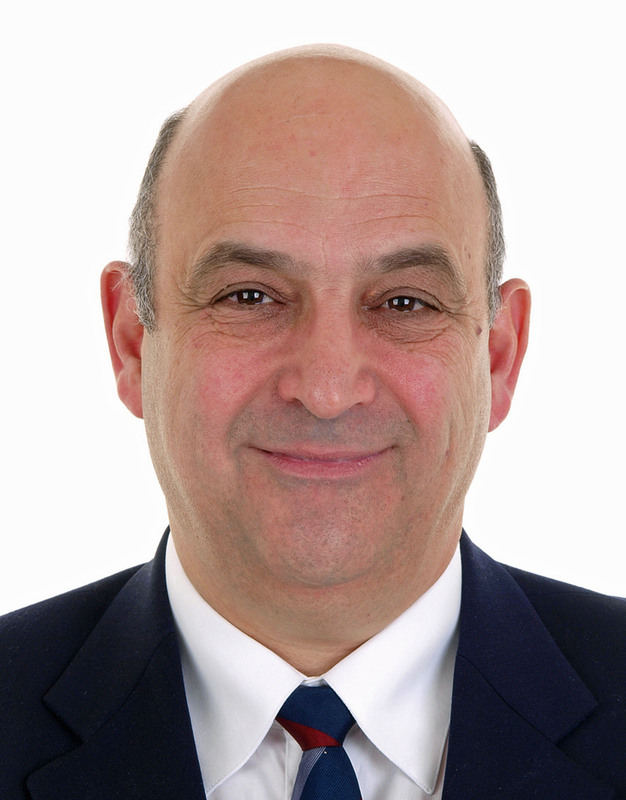 Franco Famularo (UTS Class of 1994) lives in Montreal, Canada, and serves as Secretary-General of the Universal Peace Federation, Canada. He is also Vice Chair of the Board of Trustees of Unification Theological Seminary. Photo at top: Canadian Prime Minister Justin Trudeau meets with U.S. President Donald Trump at the White House in February 2017. Thank you, Franco, for your informative essay. It has helped me understand a little of the healthcare issues in the USA we read about frequently in the European media. Most European countries have a different approach to the USA with regards to this issue. I also agree with your statement that only a healthy population will constitute a healthy nation. And this applies to both the physical and spiritual dimensions of humans. Thanks for your comment, Johann. The healthcare system in the USA is quite complex. In Canada, we learn a lot about how things work in the U.S. as we are influenced greatly by what happens just a short distance away from the border. We also get criticism of our system along with complaints about how expensive healthcare costs from many Americans who simply cannot afford it. No system is perfect and until human beings become more altruistic any system will have faults. Thank you, Franco. Lots to think about for Australians too. Thank you, Franco, for your extensive and helpful discussion of two topics, immigration and healthcare, comparing the U.S. and Canada. Regarding immigration, merit and family ought to both be considerations, but the main point that struck me is that no healthcare is provided to a person without legal identification. The real problems for a society is not the idea of people crossing borders, but people abusing the social infrastructure or committing crimes. Legal immigration should provide identification cards for receiving any social services, public school enrollment, or voting. If there is no “free ride” then you will naturally draw people willing to carry their own weight, or they have to either go back to their own country or rely on the private sector for any services. As for healthcare, the U.S. system is very messed up because of third-party payers, going back to World War II, when there was a wage freeze and employers began offering health plans. This began the escalation of prices by insurance companies because people began using unneeded services they would not have paid for themselves, and employers, as third parties, could not check the escalation of costs but just paid them. The best solution is not to have states pay, like in Canada. That will arrest price gouging by insurance groups, but government services are still less efficient because prices are not set by a competitive market. In a situation of genuine competition, prices will be lower than government set prices or there will be rationing. The main problem in the U.S. are regulations that prevent the market from working and, as you mention, much of this is caused by monopolistic insurance groups and unscrupulous lawyers. One example of insurance monopoly is in New York. One doctor set up a system where people pay $29.95 per month and that would cover all services provided by his clinic. Then clients could have a high deductible policy in case of a real calamity. People liked this and he soon had five clinics. Then the insurance companies became afraid and asked New York State to shut his business down. The crony capitalist bureaucracy in New York agreed. Clearly that type of regulation prevents the market from working. If that clinic had been allowed to thrive, insurance companies would have been forced by the market to lower their prices. Another example from here in Minnesota. Hospitals were charging $2,000 for a CT scan. Private scan clinics set up and started charging about $300 for the same scan and sending results to the hospitals. The hospitals got together and lobbied the government to place a ban on building any more radiation scanning clinics except in the hospitals. The state legislature caved in to the hospital lobby. A personal example. I went to a hospital for a preventive scan. After the test was completed, they asked if I wanted to pay cash of $275 or have them bill the insurance company for $850. I believe in Medicaid and Medicare to ensure that the impoverished and elderly (legal citizens) are covered. However, Medicaid and Medicare are getting bilked.They are paying these inflated non-market prices. If the market were allowed to work for the medical system as a whole, Medicare and Medicaid could check real market prices and offer that amount. This would save the taxpayers a lot of money. Thank you, Gordon, for your important and pertinent comments. I very much appreciate your real life examples. In an advanced age like ours, identifying newcomers to a country would not be for lack of efficient technology. Access to public service should require digitized identity cards. Back in the ’70s and ’80s, I remember Americans crossing into Canada when one did not need a passport and borrowing someone’s health card to have access to the health clinics and hospitals. It is no longer that easy. Of course there is the issue of privacy, etc… but digitized ID cards can provide a lot of info. In Canada each province issues each resident a health services photo ID that also serves as proof of residence. This serves as an extra layer of security. As to overcoming corruption and abuse, The non-market prices are true for both the public and private systems. In a 2014 interview with Scientific American, Dr. Gino Strada, one of the recipients of the 2017 Sunhak Peace Prize, gives the example of the cost of open heart surgery being $3,000 USD at his clinic in the Sudan compared to $20,000 USD in Italy. He asks, where does the rest of the money go? His view is that if a patient becomes a client and a clinic becomes a business, it is the end of medicine. This from a doctor who is dedicated to the service of refugees and people in war-torn areas. I remember a time from my youth where many nurses were from religious orders. They were dedicated to the task due to a sense of mission — it was a vocation. A medical system driven by self-interest is not a solution. I agree that digitized ID cards are a good form of identity card. There are privacy and identity theft problems that worry a lot of people. Government employees should suffer a harsh penalty for abuse. We just had a case of a person with access to a license plate database going to theaters and getting the numbers of plates on high-end cars and then robbing the house while they knew the owners were in the theater. Organ donors could also become targets. As for market prices, I purposely stated “competitive market,” because in a genuinely competitive market there will be no excess profit. In a competitive market, efficiency and quality of service reaches its highest level and prices reach their lowest level. In the government sphere, prices never match the competitive market price. However, in the private sphere an unregulated market will also never reach a competitive price if resources are controlled by a monopoly or cartel. In healthcare in Italy and the U.S., there are basically government licensed cartels. The real solution in the U.S. is not simply to have a private sector or mixed sector market, but to have a competitive market. The example I gave of the clinic in New York shut down by the insurance lobby was an example of a government-restricted market in which supply is artificially curtailed to drive up prices. Wall Street loves this collusion with government because in a truly competitive market you would not have many Wall Street profits. Thank you, Franco. Just to let you know, churches do still run a great many of the hospitals in the U.S. However, they have never been “responsible for healthcare”. They started hospitals because the Gospels tell them to care for the sick. Many of us here in he U.S. are skeptical of the avowed lack of profit motive of government. Governments claim to work for the benefit of the people, but they often appear to care more for their own benefit. We would just switch from paying the insurance company to paying the government and the government could raise our taxes to pay for the extra costs. Thank you, Margaret, for raising the issue of a profit-driven vs. a government-run healthcare system. Skepticism of government and bureaucracy is not limited to the U.S. Government agencies everywhere are run by human beings who often have motives to preserve their roles and institutions. On the other hand, one can’t fully trust a profit-driven private system either. Selfishness and greed too often interfere. Private industry may claim to work for the benefit of the customer and although they can’t raise taxes they can certainly increase prices. And one reason health care costs in the U.S. are more than double what they are in most industrialized countries is precisely due to a profit-driven system. Insurance companies that exist to please shareholders are not any more “selfless” than government officials. The fundamental issue to solve is corrupt human beings. A balanced mix of public-private might work given that a perfect system doesn’t exist. A lot more funding for research and development would be available if checks and balances were effective. Government, industry, labor unions, and academia should be in a collaborative relationship rather than a confrontational one.